I started a new job in April, and the company I work for has a couple of really big properties in Maryland. My boss asked me to spend the last part of the summer in residence at one of them to study the operation, which means I basically have no defined responsibilities right now and have some time to wander around aimlessly to see what’s here. 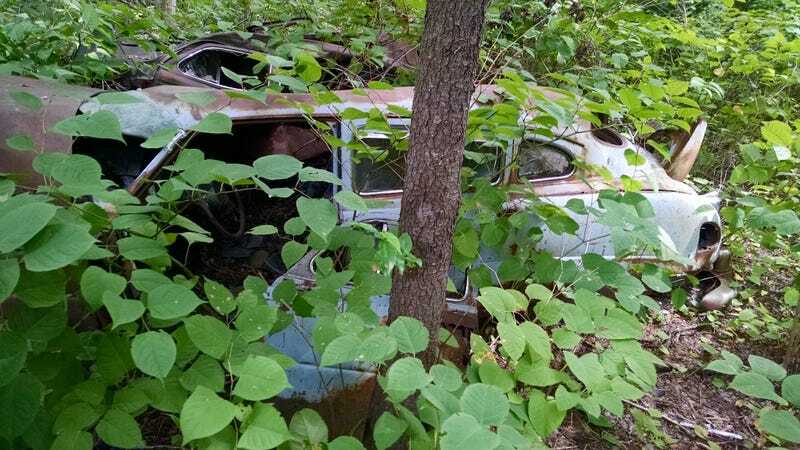 It turns out that we have at least two junked ‘40s cars from orphan brands back in the woods - a step-down Hudson and an immediate postwar (‘46/’47?) DeSoto. Both are basically crushed from when the farmer or whoever rolled them in to place with a tractor, and the Hudson may have been in a front end collision before being junked. Not much, if anything, salvageable on either of them, but kind of a neat find.